French team Groupama kept up their momentum by rounding Cape Horn in first place on the fifth leg of the Volvo Ocean Race, while behind them Abu Dhabi completed a dramatic mid-ocean repair job. 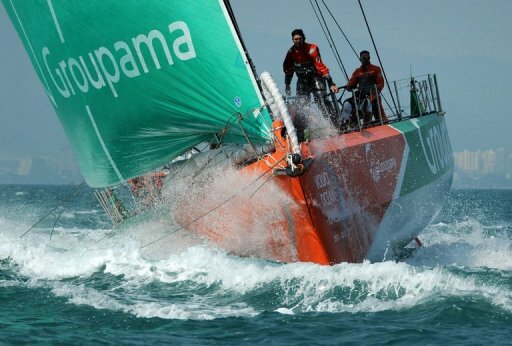 Groupama passed the maritime icon of Cape Horn at 1255 GMT on Friday and were followed less than an hour later by American rivals Puma, at 1352. Telefonica, who are 15 points ahead of Groupama in the overall standings, will likely be next to pass the tip of South America some time on Saturday before they make their way into port for a brief pit stop to repair the bow of the boat. A total of four boats have suffered major structural damage in brutal Southern Ocean conditions on the leg. Camper, in third place overall, are heading to Chile for repairs, Sanya have written off this leg and the next because of a broken rudder and Abu Dhabi are considering their options after mid-sea heroics overnight. Skipper Ian Walker and his crew managed a nerve-wracking operation that saw the team deliberately tilt the boat to one side at an alarming angle for five hours while the team drilled 32 bolt holes in the hull and inserted metal rods to re-attach the interior core structure to the outside. Irish sailor Justin Slattery was then suspended over the side, attached to a rope and wearing a survival suit, to tighten the bolts. "It’s the strangest thing I’ve ever done, at least in a boat," said Walker. "But it’s amazing how quickly you can switch from racing mode to survival. "You learn a lot about your team when something like this happens and everyone of us stepped up to help stabilise the situation." Abu Dhabi, who had been hoping to challenge Telefonica for the third podium place, are now considering whether to head for land for a proper repair. The leaders still have 2,000 nautical miles to go in what continues to be an epic leg. They are due to arrive in Itajai around April 4-5. 1. Telefonica (Spain) 122 points; 2. Groupama 107; 3. Camper/ETNZ (Spain/New Zealand) 104; 4. Puma (United States) 83; 5. Abu Dhabi (United Arab Emirates) 55; 6. Sanya (China) 25.